Sebastopol Family Acupuncture is conveniently located just outside downtown Sebastopol on the corner of Pitt Avenue and Healdsburg Avenue. From Santa Rosa: take Highway 12 west into Sebastopol. Turn right onto Petaluma Avenue and follow it around to the left as it turns into McKinley Street. Turn right onto Main Street and bear left onto Healdsburg Avenue. Turn left onto Pitt Avenue. From Forestville: take 116 south until it turns into Healdsburg Avenue. Turn right onto Pitt Avenue. 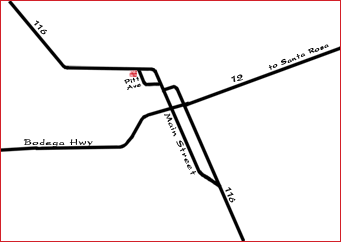 From Cotati: take 116 west into Sebastopol until it turns into Petaluma Avenue and follow it around to the left as it turns into McKinley Street. Turn right onto Main Street and bear left onto Healdsburg Avenue. Turn left onto Pitt Avenue.